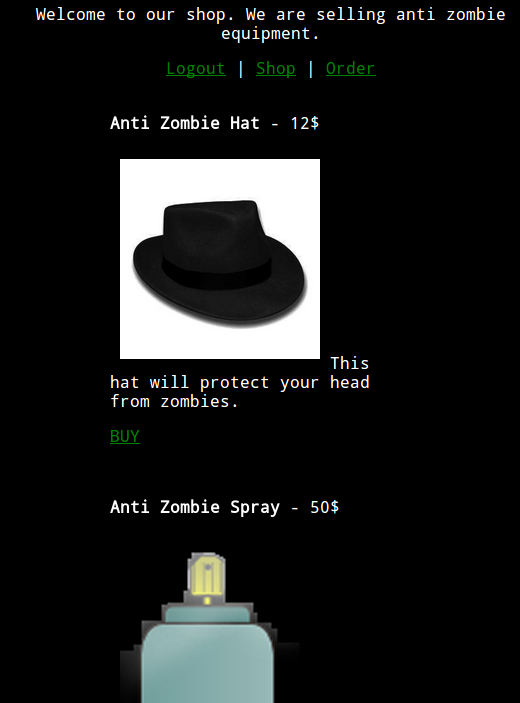 A new company offers a lot of anti zombie equipment to protect yourself. Unfortunately not everyone can buy the good stuff. Only privileged users may do so. We managed to create an account, but it is not privileged. Your mission is to buy “Anti zombie Spray”. 0000000: dec8 aabc 7e39 277a 81fd c2f5 2920 86ad  ....~9'z....) ..
You can notice only 8 byte changed. DES with ECB mode comes on mind. But we don’t know anything about the plaintext format, so how can we generate a valid ciphertext for the product id 2? The most straight forward way is bruteforce. We can bruteforce key and then encrypt anything we want. 0000180: e43b bd10 64ea 7026 9260 686f b828 d4e1  .;..d.p&.`ho.(.. Let’s try different charsets separately: 0-9, A-Z, a-z. Also, DES key’s low bits are meaningless, so the real charsets are 02468, ABDFHJLNPRTVXZ and abdfhjlnprtvxz. The flag for this challenge is spr4y4me. Supposed by awesie from PPP. 0000170: 4c38 ff8a 9c93 d994 200a                 L8...... .
set PHPSESSID to xxAAAAAAA00000002AAAAAAAA (padding guessed experimentally) 0000140: 95d2 a231 d6a7 6cd4 2d91 6672 a90c ed48 ...1..l.-.fr...H 0000150: 9a1f 8712 a6d3 c9fa 2d91 6672 a90c ed48 ........-.fr...H 0000160: 6876 d91d 7655 0a35 8d0b 3643 4c8d 0ecf hv..vU.5..6CL... 0000170: 4c38 ff8a 9c93 d994 200a L8...... .
Recall that “AAAAAAAA” is encrypted to “\x2d\x91\x66\x72\xa9\x0c\xed\x48”. Here you see “\x9a\x1f\x87\x12\xa6\xd3\xc9\xfa” between 2 encrypted “AAAAAAAA” blocks – it is encryption of “00000002”. Now let’s get encryption of “;i:1;}}\x00”: we can adjust length of PHPSESSID cookie to make the last block be “;i:1;}}”. 4 is to full block, we need minus one byte for “;i:1;}}\x00” – so the encryption is “d39919dcecc1cdcf”. Result: The flag for this challenge is spr4y4me. PS: It’s very hard to solve it in this way if you don’t know the format of the plaintext data. dec8 aabc 7e39 277a 81fd c2f5 2920…. I have changed the order, but the cookie data always start with : “60C8 9D9B…”. First off, thanks for sharing, really helpful. Could you please explain why ‘A’ and ‘a’ are part of the charset range? I got confused since those are odd numbers discarded by the low bit right? B ^ 1 = C, so B is equal to C in des key. Tha’s why we have 26 letters in alphabet, but we need to try 14 instead of 13. Got it. Thanks for the explanation. Now I am ready for the next CTF, LoL!